Advertise in our Annual Program Guide! Are you looking for an exciting advertising opportunity to be seen by thousands of Sleepy Hollow visitors? 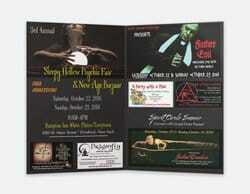 Try a display ad or business listing in the Festival of Witches program guide! Festival of Witches will be printing 5,000 6- page full-color program guides. Program guides are carried in shops and attractions throughout Sleepy Hollow and Tarrytown, New York and surrounding areas. Program guides are pre-stuffed into event participant gift bags at Sleepy Hollow events and other Halloween events throughout the Hudson Valley region of New York and NYC. They're also given to each guest attending the Psychic Fair & New Age Bazaar. Business Listings include two lines; line 1: Your business name and website or contact info, the second line a description of your products and or services (up to 30 letters, numbers or spaces). This is a great way to get the word out about your product, shop, web site, or other business! If you're interested in becoming a sponsor, please see the specs, rates and sample pages at the link below and then email us us to see if there's still ad space available! Ad Sizes and Prices: ONLY 20 SPACES AVAILABLE! • Payment, due by September 13, 2019. Art, web link, and 30 word text for listings due by September 20, 2019.